Born April 18, 1973. Ordained June 6, 2009. 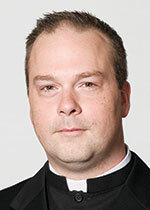 Associate pastor, St. Barnabas, Indianaplis; 2010, associate pastor, St. Pius X, Indianapolis; 2012, administrator, Our Lady of the Most Holy Rosary, Indianapolis, chaplain, St. Joseph of Aramithea Society of the Anglican Ordinariate; associate director of spiritual formation SaintMeinrad Seminary and School of Theology, St. Meinrad, 2013, director of spiritual formation Saint Meinrad Seminary and School of Theology, St. Meinrad, and weekend sacramental minister, Our Lady of the Springs, French Lick and Our Lord Jesus Christ the King, Paoli; 2016, continuing as director of spiritual formation, Saint Meinrad Archabbey and School of Theology, St. Meinrad.